Ten years ago I lost my husband Jack Morgan Channell, on the evening of Easter Sunday – April 12, 2004. I remember thinking how whatever day you lose someone always becomes that dreaded day of the year, and that if it fell on a holiday it would forever dampen that particular holiday. When Jack died on Easter, it struck me that it was such a wonderful day to remember him on. Easter. To me it is most certainly NOT about the Easter bunny (I have no problem with egg decorating, egg hunts, and Easter baskets. and I love marshmallow peeps.) BUT I do think it just isn’t about all that. I am not even sure how a rabbit got into the translation! Easter is the day we celebrate that Jesus was resurrected from the dead! Death had no power over Him, and because of that we are offered the same gift! Granted, I understand not every one may believe this. I for one, DO! I believe my husband passed from this place (earth) to another place (heaven) with just one breath. You take that one last breath here, and the next breath you take in eternity. Because I know what my husband believed, I know where he is. I never for a minute stop missing him, but knowing where he is is a tremendous comfort. I don’t ever wonder if he’s wandering around the earth, or lost in space, or somewhere alone. Not for a moment. I know he was absent from his body, then present with God. Having said that, it has always blessed me that he passed away on Easter. Easter doesn’t always fall on the same date, but it is close enough that I associate losing him with the holiday. So, while my family will of course be sad again this year, and 10 years is such a long time to miss someone, and to see all the voids he left that will never go away, I felt like God gave me a personal gift this year. (ok, not just for me…..but, it sure seems like it could be. :)) It was my first service in OneChurch International in LA, where I live now, when it was announced that the producer of a new movie coming out, would be speaking that morning and sharing about the movie! 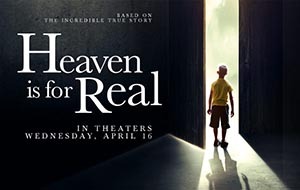 The name of the movie was – HEAVEN IS FOR REAL. Of course that caught my attention! I had heard of the book, though never read it, about a little boy who had a near death experience and went to visit heaven. I could not wait to hear about it! DeVon Franklin currently serves as Senior Vice President of Production for Columbia Pictures, a division of Sony Pictures and Entertainment ,and was the speaker at church that morning. He talked about making the movie, and shared what it was about. I was so excited that a movie about heaven was coming out! Heaven is spoke of in the Bible as OUR HOPE. There’s a reason for that – when this life is overwhelming, over the top stressful, and maybe even feels hopeless, God meant for us to keep heaven on our mind and in our hearts , to be our driving force to keep us going, and get us through! Not matter what happens here, this life is but for a moment. Heaven will last for all eternity. It is His gift to us. (that none should perish but that all should have the gift of eternal and everlasting life.) It truly is our hope! I walked out of service to a film crew standing there, wanting volunteers to talk about what heaven meant to them. I felt a tug in my heart that I should say something. So, I waited in a line. A lot of people left, as we had to wait till the next service was over and it was quieter to hear those being interviewed. I still felt to wait. So, I went in and sat down for service no. 2, which was as good as service no. 1. Finally it was my turn to look into a camera, and share what heaven meant to me. To sum it up, I shared how I had lost my husband 10 years ago, and that the past 10 years had been very difficult for my family. I shared that if NOT for my belief that Jack was in heaven, and that we would all be together again, I could not have gone on. I said how of ALL the movies about God coming out this year, I felt THIS one was the most significant. BECAUSE IT BRINGS THE MESSAGE OF HOPE. And we ALL need hope. Heaven IS our hope, that there is more to life than just our mere 70+ years (more or less) on planet earth. I hugged the interviewer afterwards, and said – Thank you for letting me do this. I felt like I got to do it in Jack’s honor. It was NOT a sad thing anymore; God had turned my mourning to joy. 🙂 This Movie is In Honor Of All Those Who Have Gone Before Us!